Ahadi, M., Moradi, A., Rakhshan, A., Arefian, A., Rafizadeh, M., Zham, H. (2017). Basic Characteristics of Oligodendrogliomas: The Shohada-e Tajrish Hospital Experience (2008-2014). 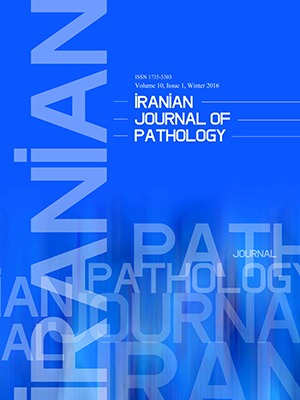 Iranian Journal of Pathology, 12(3), 241-247. Mahsa Ahadi; Afshin Moradi; Azadeh Rakhshan; Alireza Arefian; Mitra Rafizadeh; Hanieh Zham. "Basic Characteristics of Oligodendrogliomas: The Shohada-e Tajrish Hospital Experience (2008-2014)". Iranian Journal of Pathology, 12, 3, 2017, 241-247. Ahadi, M., Moradi, A., Rakhshan, A., Arefian, A., Rafizadeh, M., Zham, H. (2017). 'Basic Characteristics of Oligodendrogliomas: The Shohada-e Tajrish Hospital Experience (2008-2014)', Iranian Journal of Pathology, 12(3), pp. 241-247. Ahadi, M., Moradi, A., Rakhshan, A., Arefian, A., Rafizadeh, M., Zham, H. Basic Characteristics of Oligodendrogliomas: The Shohada-e Tajrish Hospital Experience (2008-2014). Iranian Journal of Pathology, 2017; 12(3): 241-247. Background and Objectives: Gliomas are the most prevalent subgroup of primary brain tumors with a relatively high mortality. However, oligodendrogliomas have a better prognosis compared to other subtypes due to their sensitivity to chemotherapy. Considering the low incidence and the resulting lack of information about oligodendrogliomas, particularly in Iran, this study aimed at assessing their basic characteristics. Methods:In this descriptive retrospective study, patients with definite diagnosis of oligodendroglioma were identified by reviewing the archives of pathology reports at the department of pathology of Shohada-e Tajrish Hospital during years 2008 to 2014. Age, gender, location, and the grade of the tumor were extracted and entered to the SPSS statistical software for analysis. Results: A total of 182 patients, including 115 males (63.2%) and 67 females (36.8%), were included with a mean age of 38.5±13.36 years. Frontal lobe was involved in 53 patients (29.1%), parietal lobe in 31 (17.0%), temporal lobe in 22 (12.1%), frontoparietal area in 15 (8.2%), parieto-occipital area in 11 (6.0%), temporoparietal and frontotemporal areas each in 9 subjects (4.9%), occipital lobe in 5 (2.7%), and the brainstem in 4 (2.2%). Furthermore, 108 cases (59.3%) had grade-2 and the remaining74 patients (40.7%) had grade-3 anaplastic oligodendrogliomas. The mean age of subjects with brainstem oligodendrogliomas was significantly lower than the other patients (p=0.025). Conclusion: Oligodendrogliomas commonly effects the frontal lobe, followed by the parietal and temporal lobes. The mean age of subjects with brainstem lesions was significantly lower than other patients. Age, gender or location of the tumor did not independently predict a higher grade lesion. 1. Allison RR, Schulsinger A, Vongtama V, Barry T, Shin KH. Radiation and chemotherapy improve outcome in oligodendroglioma. IJROBP. 1997;37(2):399-403. 2. Karim AB, Afra D, Cornu P, Bleehan N, Schraub S, De Witte O, et al. Randomized trial on the efficacy of radiotherapy for cerebral low-grade glioma in the adult: European Organization for Research and Treatment of Cancer Study 22845 with the Medical Research Council study BRO4: an interim analysis. IJROBP. 2002;52(2):316-24. 3. Ellis TL, Stieber VW, Austin RC. Oligodendroglioma. Curr Treat Options Oncol. 2003;4(6):479-90. 4. Engelhard HH, Stelea A, Mundt A. Oligodendroglioma and anaplastic oligodendroglioma:: Clinical features, treatment, and prognosis. Surg Neurol. 2003;60(5):443-56. 5. Van den Bent M, Taphoorn M, Brandes Aa, Menten J, Stupp R, Frenay M, et al. Phase II study of first-line chemotherapy with temozolomide in recurrent oligodendroglial tumors: the European Organization for Research and Treatment of Cancer Brain Tumor Group Study 26971. J Clin Oncol. 2003;21(13):2525-8. 6. Fleury A, Menegoz F, Grosclaude P, Daures JP, Henry‐Amar M, Raverdy N, et al. Descriptive epidemiology of cerebral gliomas in France. Cancer. 1997;79(6):1195-202. 7. Van den Bent M. Advances in the biology and treatment of oligodendrogliomas. Curr Opin Neurol. 2004;17(6):675-80. 8. Hashimoto N, Murakami M, Takahashi Y, Fujimoto M, Inazawa J, Mineura K. Correlation between genetic alteration and long‐term clinical outcome of patients with oligodendroglial tumors, with identification of a consistent region of deletion on chromosome arm 1p. Cancer. 2003;97(9):2254-61. 9. Jacob R, Jyothirmayi R, Dalal Y, Nambiar U, Rajan B, Nair M. Oligodendroglioma: clinical profile and treatment results. Neurol India. 2002;50(4):462. 10. HELSETH A, MØRK SJ, JOHANSEN A, TRETLI S. Neoplasms of the central nervous system in Norway. APMIS. 1989;97(7‐12):646-54. 11. Nutt CL, Mani D, Betensky RA, Tamayo P, Cairncross JG, Ladd C, et al. Gene expression-based classification of malignant gliomas correlates better with survival than histological classification. Cancer Res. 2003;63(7):1602-7. 12. Peterson K, Cairncross JG. Oligoden-droglioma. Cancer Invest. 1996;14(3):243-51. 13.Kleihues P, Cavenee WK. Pathology and genetics of tumours of the nervous system: International Agency for Research on Cancer; 2000. 14.Celli P, Nofrone I, Palma L, Cantore G, Fortuna A. Cerebral oligodendroglioma: prognostic factors and life history. Neurosurgery. 1994;35(6):1018-35. 15. Daumas-Duport C, Varlet P, Tucker M-L, Beuvon F, Cervera P, Chodkiewicz J-P. Oligodendrogliomas. Part I: Patterns of growth, histological diagnosis, clinical and imaging correlations: a study of 153 cases. J Neurooncol. 1997;34(1):37-59. 16.Engelhard HH, Stelea A, Cochran EJ. Oligodendroglioma: pathology and molecular biology. Surg Neurol. 2002;58(2):111-7. 17. Paleologos NA, Cairncross JG. Treatment of oligodendroglioma: an update. Neuro Oncol. 1999;1(1):61-8. 18.Louis DN, Ohgaki H, Wiestler OD, Cavenee WK, Burger PC, Jouvet A, et al. The 2007 WHO classification of tumours of the central nervous system. Acta Neuropathol. 2007;114(2):97-109. 19.Feigenberg SJ, Amdur RJ, Morris CG, Mendenhall WM, Marcus Jr RB, Friedman WA. Oligodendroglioma: does deferring treatment compromise outcome? Am J Clin Oncol. 2003;26(3):e60-e6. 20.Fortin D, Cairncross GJ, Hammond RR. Oligodendroglioma: an appraisal of recent data pertaining to diagnosis and treatment. Neurosurgery. 1999;45(6):1279. 21.Sunyach M, Pommier P, Lafay IM, Guyotat J, Ginestet G, Jouanneau E, et al. Conformal irradiation for pure and mixed oligodendroglioma: the experience of Centre Leon Berard Lyon. IJROBP. 2003;56(1):296-303. 22. Shaw EG, Scheithauer BW, O'Fallon JR, Tazelaar HD, Davis DH. Oligodendrogliomas: the Mayo clinic experience. J Neurosurg. 1992;76(3):428-34. 23. SPSS I. IBM SPSS statistics 22. Algorithms Chicago: IBM SPSS Inc. 2013. 24. Nielsen MS, Christensen HC, Kosteljanetz M, Johansen C. Incidence of and survival from oligodendroglioma in Denmark, 1943–2002. Neuro Oncol. 2009;11(3):311-7. 25. Mørk SJ, Lindegaard K-F, Halvorsen TB, Lehmann EH, Solgaard T, Hatlevoll R, et al. Oligodendroglioma: incidence and biological behavior in a defined population. J Neurosurg. 1985;63(6):881-9. 26. Chin HW, Hazel JJ, Kim TH, Webster JH. Oligodendrogliomas I. A clinical study of cerebral oligodendrogliomas. Cancer. 1980;45(6):1458-66. 27.Reyes-Botero G, Mokhtari K, Martin-Duverneuil N, Delattre J-Y, Laigle-Donadey F. Adult brainstem gliomas. The oncologist. 2012;17(3):388-97.